Note: Last year he won the Fitz Dixon Jr. Memorial at Presque Isle followed by the Breeders' Futurity (G1) at Keeneland. Shipped west to California where he was 3rd in the Breeders' Cup Juvenile (G1) and then 2nd in the CashCall Futurity (G1). 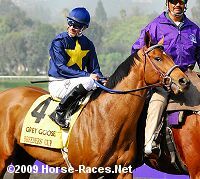 In his 2010 debut, he finished 2nd in the Rebel Stakes (G2) at Oaklawn, and then finished fifth in the Arkansas Derby (G1) on April 10. In the Kentucky Derby he was 5th beaten 6 lengths after gaining the lead at the 1/4 pole.